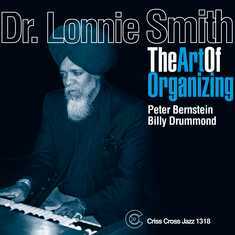 Brace yourselves for The Art of Organizing, the very first appearance on Criss Cross by organ master Dr. Lonnie Smith. Organ jazz is of course an important part of the Criss Cross catalog. Our releases by the likes of Melvin Rhyne and Sam Yahel bear that out, also demonstrating how this vital idiom spans the generations. And you're very likely to find that a Criss Cross organ date involves modern master guitarist Peter Bernstein, an important leader for our label in his own right. Indeed, it is none other than Bernstein who joins Smith on The Art of Organizing. Billy Drummond, one of the more prolific and sensitive drummers of our time, completes the lineup. From his early days with George Benson and Lou Donaldson to the present day, Dr. Lonnie Smith has always been a driving force in jazz. The Art of Organizing, featuring Smith and trio on standards and a batch of strong new originals, is another contribution that will remain timeless.